Focus Less on Net Income and More on Net Time | Passive Income M.D. We all understand the concept of net income or net pay. If you’re an employee, it’s what you see deposited into your bank account after Federal & State taxes, Social Security taxes, Medicare taxes, etc. are all withheld. If you’re self-employed, it’s what you’re left with after you set aside the funds for many of those same taxes plus paid off your business expenses. 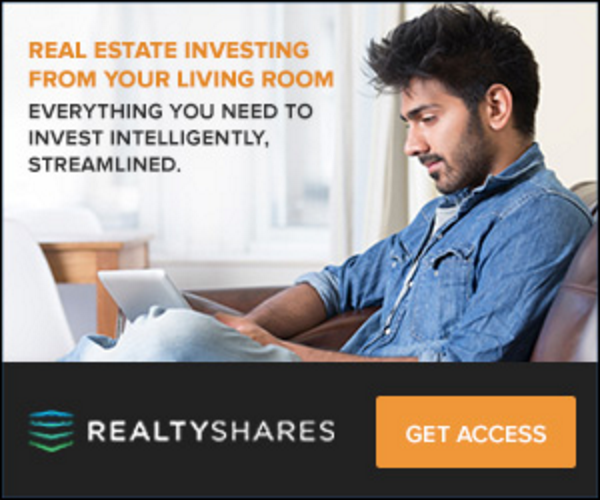 In real estate, the term is referred to as net operating income. 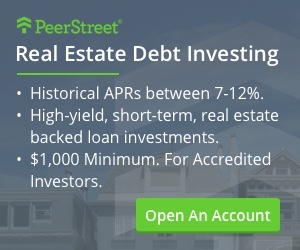 It’s the bottom line after taking your gross rents and subtracting out all operating expenses including management fees, repairs, property taxes, utilities, etc. Gross income and gross rents are important, but at the end of the day, we all know that it’s the net income that matters because it’s that number that determines how you live your life. We seem to focus our efforts so heavily on our net income, but how many of us give that same energy and thought when it comes to our time. Sure, we all have the same gross time, 24 hours or 1440 minutes a day, but how much net time do you have? 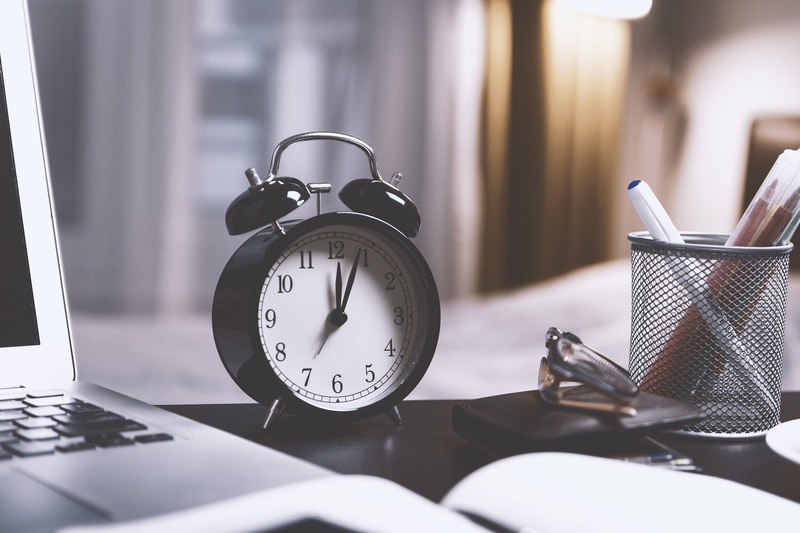 This is the time you have left over after chores, obligations, commuting, necessary sleep, eating, working, and other things you don’t enjoy doing. What remains is time that you can spend doing whatever you choose. 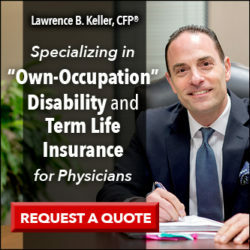 Many of us are faced with dropping reimbursements, increasing overhead costs, and greater costs of living. . . what seems to be our solution? We work more. We trade more time for money, and though we might be able to maintain the same level of income or perhaps an increase, we’ve done so by giving away large chunks of our net time. We’re suffering from a drastic reduction in our net time. When people want more time to do things, the first thing we usually give up is sleep – we stay up later and set the alarm earlier. But that only ends up hurting your health, your mood, and your energy. In my opinion, this solution is not sustainable. Instead, think about being more efficient. Think about how to reduce those things that cut into your net time. One of my favorite books that talks about the concept of net time is The 4-Hour Workweek by Tim Ferriss. He’s a huge advocate of automating and outsourcing whatever you can to be efficient with your time. As a family, we tend to buy the same things every trip to the supermarket or to Costco. With a growing family, we go 1-2 times a week, each time taking an hour all-in. Well, we had no idea that we can just have it all delivered for free (over $25) with prices essentially identical to what’s in the store. We’ve been doing that for Costco deliveries but we literally signed up today to have our groceries delivered to us from now on, which should save us 1-2 hours a week and 4-8 hours a month at no additional cost. If you’re not automating your bill pay for recurring bills, that’s wasted time. Set up automatic payments for everything and move on. Yes, I understand it’s important to review your credit card statements, but we look at it once briefly every month. Do you go look through multiple websites to find all your financial info? That’s wasted time. Throw it all into Personal Capital and login once. How many of you enjoy cleaning your own house from top to bottom? Honestly, my wife and I do not enjoy it at all. We’re a dual physician family and we’ve both cut down our clinical times quite a bit, but we did that to spend more time doing the things we love with our family. We decided that we’re going to outsource our cleaning. It takes a professional crew about 3 hours and to us, it’s so worth the cost. On the advice of Tim Ferriss, I’ve hired virtual and real-life assistants to perform tasks from time to time. I’m happy to have someone else do some of the tedious things I would normally have to do myself. This allows me to do useful things with my time, like running and planning my businesses and educating myself further. I consider the money I spend on assistants an investment. Best of all, these assistants allow me to spend more net time with my family and friends. What do these assistants do, exactly? Creating spreadsheets, scanning, dropping off packages, helping to figure out travel plans. . . the list goes on. The more I use them, the more I find ways for them to be helpful and ultimately the more free time I create. I’ve heard other bloggers like the Physician on Fire praising the benefits of living close to work. 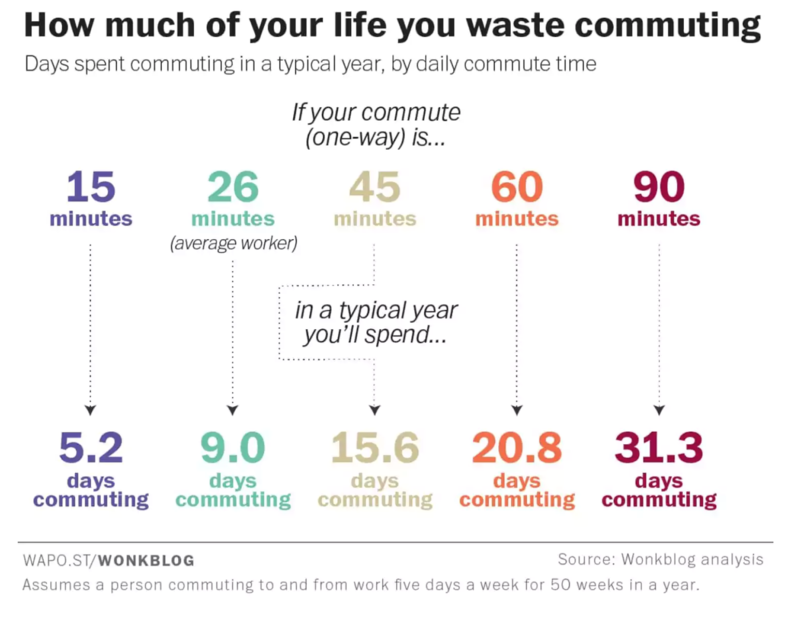 I also really enjoyed this article by the Washington post titled, The Astonishing Human Potential Wasted on Commutes. The average person spends 9 full days dedicated to commuting each year and it’s getting worse every year. Is there a way to reduce this? Some people are willing to commute a long way for a little more pay. Is it truly worth it? I recently talked to a physician who was mulling a change in job for an increase in salary. The problem is the commute was 90 minutes away. That’s 3 hours of commuting every day! He told me the downside would be that he would never get to see his young children during the week as they’d be asleep by the time he got home. Is the increase in salary worth the loss in net time? I’ve considered getting rid of my car altogether and using a rideshare service like Uber or Lyft exclusively for my commutes to work. According to AAA in 2017, the average cost of owning a car is almost $8500/ year or $706/month when you include, gas, maintenance & repairs, and depreciation. But they didn’t even include monthly payments for a car. If you factor that in, a car could cost you $40-50 a day. Considering this, daily rideshare seems more appealing, especially if I could be productive on that commute, taking care of some things I would normally have to take care of during other parts of the day, again creating some free time. Don’t work for your money, make your money work for you. We’ve probably all heard this saying but how many of us actually follow it? Early on in our careers, making money relies on our own human capital, meaning we have to put the time and effort in to build up some savings. For physicians, that truly starts when we finish our training and get paid attending salaries. According to the White Coat Investor, the first few years out we should be focusing on getting rid of our student loans. I’m a huge believer of that, but I also believe that you could and should start thinking about creating multiple passive income streams at the same time. I personally set aside at least 20-30% of my income to do just that. I do invest in the stock market, mostly within tax-advantaged accounts. 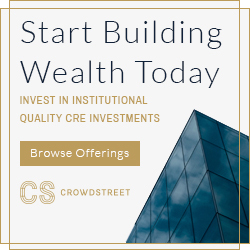 However, for cash flow, I focus on investing in real estate – direct ownership, syndications, crowdfunding, etc. My ultimate goal with these investments is complete income replacement and total time freedom. I’ve also been fortunate to be able to create some businesses that are flexible in time and location, like this blog. (If you’d like to know how much flexibility it creates, subscribe to my quarterly newsletter.) Because of the cash flow from these businesses, I’ve started gradually retiring, cutting down my clinical time significantly but remaining at the same income level or higher. Ultimately, the most precious commodity is time. If we think of time as currency, something we spend and can never get back, then how we use it becomes even more important. Many people see wealth as having a certain threshold of money, but I see true wealth as having the freedom to do whatever you want with your time. The most powerful thing about money is not the objects you can buy, but it’s the time you can free up – net time. How much net time do you have? Have you figured out a way to gain more net time? I agree. Time is currency, just as money is. They are opposite sides of the same coin. Do you think we are more wasteful of time or money as high income professionals? Good question! I may have to post this one on the Passive Income MD FB Group. If I had to choose one, it’s probably time. We’re notorious for overworking ourselves only to regret it later in life. This post is a great reminder about what’s important in life! I think all of your suggestions for automating are spot-on, even if we’ve only implemented one of them (paying bills and tracking finances). We’ve talked about hiring a house cleaner, but at this point we’ve been able to manage it ourselves. The section on commuting is eye-opening. The average worker spends 9 days on the road just going to-and-from work every year?! That’s crazy! We live “rural” by some people’s standards. If there’s a lot of traffic, it MIGHT take us each 5 minutes to get to work. Not sure I could handle much more than that, lol. Hour-long commutes are standard in my town. In fact, hour-long drives to go out to dinner and meet a friend are common. It’s nuts! Timely post! (Pun intended). I like the comparison with NOI and it is so true. We also try to redirect and outsource tasks related to the running of our household. Google Express has saved us hundreds of hours already. Like you, I’ve been trying have my money work for me so I trade less of my time for money. But not only my money; I leverage other people’s money (OPM) to work for me too. This is in the form of tenants (pay the rent), bank (mortgage), and government (tax deductions, depreciation). Way to bring in the concept of OPM. I like it. Yup, I agree. Time is my scarcest resource so I outsource anything I can. Lately I’ve been using Shipt for groceries. It is like having my own personal shopper. No need to ever grocery shop. Between house cleaners, I oversee my robot who vacuums for me. Love these modern times! Nice post as usual! My thought is that various “chores” will be enjoyed differently by different folks. Obvious, but hear me out. A commute for some goes into the time expense category. But it’s the only time I call my parents and catch up with friends on the phone (like a real conversation with my vocal cords). Or brainstorm melodies and lyrics for songwriting. I have a million voice notes on my iPhone humming/ singing/ beatboxing. I keep them all because when the final product comes out, it’s hilarious to hear the origins. Anyway, it’s not making the most of a bad situation, it’s actually the best time for these things. My wife, after working at home for a time realized how much she needed a solid commute to gear up for, and unwind from work, and to feed her NPR obsession. And as much as we love being home, my wife and I would go crazy without work. Also, at home, cooking and eating are at the center of our family bonding. One of our daughter’s favorite things is to “help” us cook. The life of our home, as was the case when I was a kid, is centered around the kitchen, with all the laughter, teamwork, and togetherness. Someone also once jokingly told me that my paternity leave was a waste of my time and potential. I heard a sermon once describing love as something that grows as you give. I find this to be absolutely true in my family. Hanging out with my kid leisurely is fun. But cooking for her and figuring out her tastes and grocery shopping for her for things that I know she’ll like and things I know she won’t but will be good for her, cleaning up after her and seeing where her trail of discovery has taken her like her favorite book making its way somehow into the guest room, folding her laundry and wistfully watching her outgrow stuff, changing her diaper, etc, even when I’m not always in the mood (and I’m as lazy as the next dude), all deepen my love and attachment to her, much more even than our trip to the playground. I suppose the goal for me isn’t to maximize net time so I can travel, watch movies, go out and do more stuff, all of which I love and do, but to be happy. And I’m different shades of happy when I’ve completed a major project at work, singing alone in my car like a jerk, cooking with my family in the kitchen with music blaring, or sitting on a beach. In fact, each of these things enhances all the others. This blog post applies to everyone, including (especially) me, as there is so much room for me to be more efficient with my time. I don’t understand how one could possibly be a functioning human parent without Amazon. But personally, some, if not most things go from the expense time (“things you don’t enjoy doing”) to the net time category. Well said! I focus so much on having choices with my time, but I guess it’s just as, if not more, important to figure out how to find value in everything I do. That must be one of the keys to happiness. Sounds like you have an extremely healthy perspective on life and I’m sure everyone around you benefits from it. You can always make more money. The same can’t be said for time! Exactly. And the government can’t tax your time. Great post! For many of us, money may increase over time while our time left is constantly decreasing. I think the most important thing is for each individual to find their ideal way to spend time and do exactly that while minimizing unpleasant tasks. For some people, that may mean hiring out lawn care, while others may find such a task a way to “unwind”. For some, 3 working days per week may be ideal while for others, maybe it’s 5. To each their own. The problem is, most people don’t get the privilege of making this choice, because they are in constant NEED of money. The beauty of financial independence is that the choice of how to spend time is in your hands. I’ve also wondered about the philosophical question you pose. On balance, I recommend that everyone pursue a profession that is guaranteed to bring in a decent amount of income, and then develop their passion on the side until it brings in enough income to supplant their primary profession. I think that’s a great strategy and mindset to have! Tim Ferriss’ The 4-Hour Workweek was very influential to me too! I don’t do a ton of outsourcing, but it did make me think more about my net time and how much value it is worth. My commute is 20-25 minutes, so at most 9 days of “wasted time commuting” a year isn’t that bad. I try to do something productive during that time like listen to podcasts or listen to the Spanish station to brush up on my language skills. And with my new Tesla arriving, my commute will be cheaper (no gas expense) and maybe I can be even more productive with enhanced autopilot and self-driving. Fortunately, my wife actually enjoys cleaning. Hopefully that doesn’t change with future little ones trashing our house! I’ve been thinking more and more about the “time is money” and “money is time” concept lately. Ever since starting my side gig, I’ve found I could put every ounce of free time into it if I wanted, and the more time I spend, the more income potential there is. That’s both good and bad. I’m used to spending a finite amount of time at work and having much of the rest of the time to do whatever it is I like. Now, I make a choice between spending time on the side gig and “leisure.” If I didn’t schedule in leisure time, there might not be much. Fortunately, I really enjoy the side gig stuff, but the last thing I want to become in my semi-retirement is a workaholic! The costs of car ownership are astounding. We drive older cars and not as often or as far as most, but since we started tracking spending, we’re at about $20 a day on automobiles. I would love to find a way to get down to one vehicle some day. I know what you mean. Side hustles that are independent of location and set times are great, however, that just might mean that you’re always working on it. I probably think about the blog way more than I should, but hey I’m having fun with it, so doesn’t really feel like an obligation. If we didn’t have to drive with car seats we’d probably get rid of both of our cars. Interesting article. How does passiveincomemd.com create passive income for you? Speaking opportunities? advertising revenue? i have my own blog i am growing and working on how to create passive income out of it. my contact email is below if you would rather discuss over email. Hi, it’s all from advertising and affiliate marketing. Takes time to grow as your readership grows. However, I’d say the best part of the blog has been the relationships I’ve made as a result of being part of this online community. I was visiting my mom, and at her request we were tackling the removal of decorative grass in the front of the house. We tussled with one large clump, she looked at the other 5 and decided she has more money than time and will hire out the rest of the work. The benefits of FI! I always thought if I won the lottery I’d hire a chef, just to not have to always decide what to eat, or fiddle with the prep. I’d want to be in the kitchen learning from him or her, but it is nice to come home to someone else having made dinner sometimes. Unfortunately my current role requires being in the office in person, so I can’t ditch the commute yet. Ideally if we could go more digital or I gain skills here and my next job is more digital I’d love to work remotely more. Save the commute and be a little greener. Yes, what good is money if it doesn’t buy you time. Some people love cooking but I am not one of them. Good luck on reducing the commute! I love this, sometimes I need to ask myself is my time worth this saving? Over the last few years I have insourced more and more, as I found I wasn’t getting value for money from cleaners, builders etc. But I do draw the line at money making scheme and side hustles, that seem more effort than you get in rewards- ultimately I’m never going to make as much on a side hustle as I do at my day job. I’m sure there’s a balance in there between outsourcing and doing things on your own. I wouldn’t sell yourself short though. Some side hustles do ultimately provide significant income while being totally enjoyable.